Comedic-crime caper. A young, talented getaway driver known as “Baby” (Elgort, ‘Fault in our Stars’) relies on the beat of his personal soundtrack to be the best. After being coerced into working for a crime boss (Spacey) for the first time, he must face the music when a doomed heist threatens his life, love and freedom… Among the rotating groups of bank robbers are Jamie Foxx as an impulsive gun-slinging cohort, and Jon Hamm as a handsome party animal/ex-Wall Street trader, while Lily James plays the innocent girlfriend. The story pitch on its own may not be too exciting, but helmer Edgar Wright (‘Shaun of the Dead’, ‘Scott Pilgrim’) is one of the funniest, most visually arresting directors working today. It’s based on his entertaining 2003 music video for Mint Royale’s Blue Song, which also starred a music-loving getaway driver (YouTube it for a good idea of what to expect). Fellow uber-director Rian Johnson has seen it and says it may be his favourite of the year. It won the Audience Award at SXSW. It has 100% rating on Rotten Tomatoes from 23 critics. – Hype. Caesar (Serkis) and his apes are forced into a deadly conflict with an army of humans led by a ruthless Colonel (Harrelson). After the apes suffer unimaginable losses, Caesar wrestles with his darker instincts and begins his own mythic quest to avenge his kind. As the journey finally brings them face to face, Caesar and the Colonel are pitted against each other in an epic battle that will determine the fate of both their species and the future of the planet… The previous two films have been surprisingly fantastic, and the director of ‘Dawn’ returns here. Given his other directorial credits are the excellent ‘Let Me In’ and the ground-breaking ‘Cloverfield’, he’s quickly established himself as one of the best in the business. 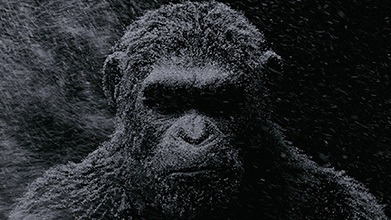 Expect more of the (almost) Shakespearian tragedy that was brought to ‘Dawn’, and more of that uneasiness of who to root for as the apes seek to kill or enslave the humans. Also returning is Andy Serkis who mo-caps/voices Caesar and is absolutely vital to the compelling ape drama of the films. ‘Rise’ and ‘Dawn’ were quite different, with 10 years and the entire virus spread separating them. By not pushing the timeline forward here and continuing the war we already saw emerge in the ‘Dawn’, there’s a slight chance this will feel a bit samey – unless they make it truly global. And will the big ape himself, King Kong, a few months earlier dampen some cinemagoer enthusiasm? 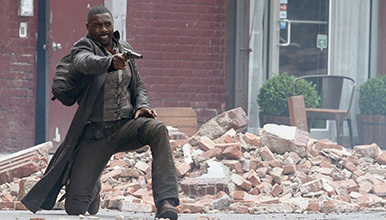 Gunslinger Roland (Elba) roams an Old West-like landscape in search of the Dark Tower (a fabled building said to be the nexus of all universes) in hopes that reaching it will preserve his dying world. Meanwhile the Man in Black (McConaughey), an ageless sorcerer and deceiver, aims to reach the Tower first and rule over its infinite kingdoms… Based on the enormous Stephen King fantasy series comprising 8 novels and 4,250 pages, King has said the movie starts from the middle of the novels, but also hinted it’s a sequel to the series, leaving some confused. It seems to be more an adaptation of the characters and universe ala, say, ‘Iron Man’, than any specific book. Signs indicate a significant amount, perhaps the majority, is set in modern New York instead of the more interesting fantasy setting of Midworld. It’s helmed by a veteran writer-director from Denmark, best known for the original ‘Dragon Tattoo’ screenplay and for ‘A Royal Affair’ which was Oscar-nominated in 2013 for Best Foreign Language. King’s writing can sometimes be muddled or translate that way (eg ‘Dreamcatcher’), the ‘Dark Tower’ mixes a lot of genres, and it’s some concern that those who’ve read the novels struggle to explain what the story is (at least on YouTube evidence). The director is fairly low profile to have been anywhere near their top choice, however… McConaughey’s pick of roles should be trusted and it’s going to be a lot of fun getting acquainted with this world-famous series. There’s also a prequel TV show coming afterwards that covers the early years of The Gunslinger. Bound for a remote planet on the far side of the galaxy, the crew of the colony ship Covenant find what they believe to be an uncharted paradise. It is however a dark, dangerous place, the original homeworld of the Engineers, whose sole inhabitant is now the “synthetic” David (Fassbender), survivor of the doomed Prometheus expedition. Could this dark lost paradise be the home of the Gods who created humanity?… Katherine Waterston (‘Boardwalk Empire’, ‘Fantastic Beasts’) plays a crew member and new female lead (pictured above), with Noomi Rapace taking a small role. Fassbender has a second role as Walter, a more advanced android who assists the crew aboard the Covenant. Danny McBride (‘Pineapple Express’) plays the pilot of the ship, which doesn’t sound safe. All stages of the alien will make an appearance: eggs, face-huggers and xenomorphs. ‘Covenant’ is being shot before Neill Blomkamp’s Alien film (which stars Hicks and Ripley), since Scott is a producer on that film too and requested Blomkamp put it on hold for a time. 1979’s ‘Alien’ was frightening in part because of the random nature of the encounter in deep space, just as discovering a new species would be plausible in any uncharted area. ‘Prometheus’s attempt to tie the aliens existence with the birth of humanity and (yes) Jesus was silly, as daft as Optimus Prime in a hieroglyph. These prequels should be about the origins of the alien not the origins of man itself, a topic too grand for Scott. With the Gods description above, ‘Covenant’ seems to be heading down that same ‘Star Trek 5’-ish path, but here’s hoping that the criticism landed last time and Scott will surprise us by correcting the mistakes of ‘Prometheus’. Even if the script (by the writer of ‘Skyfall’ and ‘Green Lantern’) turns out to be as half-baked, at the very least there will be terrific atmosphere and memorable sequences. Starring: Tom Holland, Michael Keaton, Marisa Tomei, Donald Glover, Robert Downey Jr.
15-year-old Peter Parker (Holland) tries to balance his high school life in Queens, New York with being a superhero crimefighter. But he soon finds himself up against winged villain The Vulture (Keaton)… After ‘Amazing Spider-Man 2’ underperformed, Sony buckled to fan discontent and agreed to work in co-production with Marvel Studios. Kevin Feige has creative control, while Sony still finances and distributes. Marvel says their inspirations for this third fresh start in 15 years (thankfully not another origin story) are the coming-of-age teen movies of John Hughes, where high school consequences are as important as anything. Tony Stark (Downey Jr.) and Happy Hogan (John Favreau) will also show up, after a bond was formed in ‘Civil War’. Oddly, lobby-boy Zero from ‘Grand Budapest Hotel’ is the new schoolyard bully, Flash Thompson. The director made his name with ‘Cop Car’, demonstrating an ability to get unusually natural performances from young actors. The screenwriters brought us ‘Vacation’ and ‘Horrible Bosses’, which suggests wise-cracking Spidey will be in full force. Keaton is a very intriguing villain. As Batman he kicked off the modern superhero film and now he returns to it (in another bird costume) as an even better dramatic actor, ‘Birdman’ Oscar in hand. With Marvel’s steady hand, expect this to be easily the best Spider-Man outing since 2004.